Perfectly complimenting the trend for lots of greenery, foliage and florals in wedding decor, oversized florals are set to be big in wedding cakes for 2019 – both in terms of size and the trend! For some time now we’ve been using flowers, both real and made from icing, to decorate wedding cakes. Delicate, pretty and whimsical, florals are a winning choice when it comes to adding those finishing touches to an otherwise simple cake. This year it’s all about large blooms cascading down the side of wedding cakes. With multiple tiers a must to create this look, wedding cakes are otherwise kept simple, with white icing, allowing the florals and foliage to take centre stage. Pastel tones in wedding cakes have been around for a long time, which is why this new trend for darker shades is incredibly refreshing. Stylish and romantic, white cakes are perfectly complemented by shades of muted deep plum, dark mauve, ink blue, forest green and even charcoal and black. Used in both the icing and the decor, tiered cakes are updated with layering of darker tones to the bottom, contrasted by bright white icing to the top. The whole style is pulled together through the addition of flowers and details in the same colour palette. For example, a cake with deep plum to the base would be decorated with florals in muted mauve with deep green foliage. Cakes in dark tones have a grown up yet romantic and slightly moody feel. Wedding cakes in 2019 are moving on from the absolutely perfectly smooth finish, and instead are embracing textures and layering to add interest. 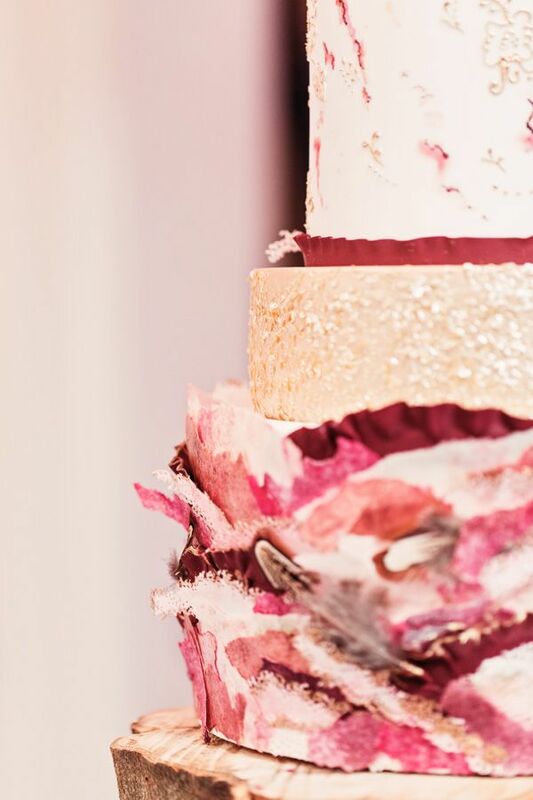 Whether it’s texture all over, or the perfect balance between smooth icing and textured details, texture can come in all shapes and sizes and can be completely unique to create the perfect wedding cake for your big day. Think icing drips down the sides of otherwise smooth tiers, buttercream layered up using a palette knife, ruffles and 3D icing designs. When it comes to texture, the sky is the limit. While wedding cake trends have recently stepped away from any over the top or luxurious details, gold is set to be the colour of choice when it comes to the details in 2019. Adding that expensive feel without being too pushy, a few gold details will add that feeling of luxury while avoiding that ‘bling’ kind of style. When it comes to adding gold to your wedding cake, gold leaf is a great way to add a touch of delicate metallic detail that looks organic and a little rustic. Gold can also be added through delicate piping or bands at the base of each tier. As wedding cake designers, we can create custom designs to perfectly compliment your wedding decor, using as much or as little gold detail as you wish. Perfectly suiting more bohemian wedding schemes and outdoor or barn venues, rustic cakes are a little more laid back in finish than your average wedding cake. With a wonderful whimsical and romantic feel to them, rustic wedding cakes appear a little unfinished, with white icing left textured and exposing the cake on the edges. A little delicate gold leaf, a few large flowers, real feathers and sprigs of foliage finish the look. Rustic cakes are best kept quite modest in size, with three tiered cakes being ideal for this style. From rustic wedding cakes to bold and unique designs, at Mama Cakes we provide custom cake designs to perfectly suit your big day. Get in touch to start discussing your ideas and create your dream wedding cake.